Aquatherm's Blue Pipe delivered material savings and a flawless installation. "It was a lot easier working with the three- and four-inch polypropylene on ladders than it would have been with copper or welded pipe." Copper prices were very high and the threat of jobsite theft loomed, so designers sought an alternative. 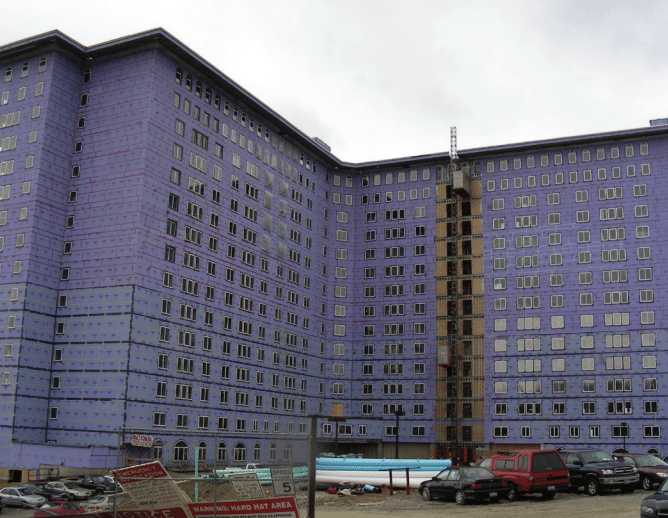 When the residents and employees of The Kenwood by Senior Star in Cincinnati are going about their days and nights in ambient comfort, it’s unlikely they spend even a moment thinking of the work that went into the design and installation of the 15-story, 515,000-square-foot tower’s heating system. Yet, in light of increasing energy prices and energy efficiency demands, that aspect of the building was an important consideration. Developed by the Stratford Companies, an Indianapolis-based developer, marketer, and operator of senior housing communities, the project started in 2008 and wrapped up in July 2010. In summer 2010, Tulsa-based Senior Star Living finalized a long-term agreement with Toledo-based Health Care REIT, Inc. to lease and operate the senior living community which was then renamed The Kenwood by Senior Star. Located on the bluffs of the Ohio River Valley in Northeast Cincinnati, the development includes a 15-story tower and one three-story residential building. While the project went through some organizational changes, it also broke some ground in terms of the specification of a relatively new to North America piping system. As the heating system was being specified, copper prices were at an all-time high. Construction site copper thefts were in the news and the project designerswere wary of posting a security force onsite 24/7/365. Paric|Ruscilli, a joint venture, served as the general contractor for the project and Cincinnati-based MCAA member, Thomas J. Dyer Company (TJ Dyer) served as the mechanical contractor. Over the last century, TJ Dyer has delivered reliable results and service for the design and installation of mechanical and plumbing systems, with a reputation as a leading mechanical contractor in the Cincinnati region, namely for mechanical installations of large plan and spec projects. The company has been awarded with, or asked to participate in, several prominent projects from The Freedom Center and The Great American Ball Park to the Newport Aquarium and area children’s hospitals. TJ Dyer is also known for seeking out and implementing cutting-edge technologies, so when polypropylene-random (PP-R) piping was introduced as a copper alternative, it was quickly embraced. The company’s major plan and spec projects manager, Jim Ramsey, was introduced to Aquatherm’s PP-R pipe systems – which have been proven in over 70 countries for nearly four decades – by Streamkey sales representative Zak Schultz. Ramsey was most impressed with the product’s longevity and the Aquatherm warranty. “The product is really a brand new 30-plus-year-old product. 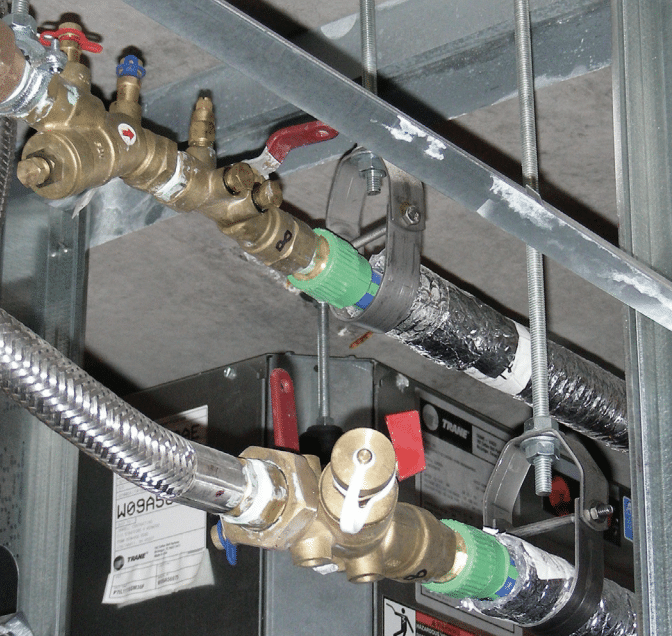 It has been proven all over the world,” Schultz said.Aquatherm’s Climatherm® was used on the high-rise’s hot water lines feeding Trane heat exchangers, from four-inch down to ¾-inch. According to Chris Kleinholz, TJ Dyer foreman, Climatherm was not going to require constant onsite security (as copper would have) and offered other benefits. A key to Aquatherm’s success is the fusion welding process that connects the pipe. The fusion process creates seamless connections that when properly executed last a lifetime, while eliminating the need for toxic materials, glues and resins, and open flames in piping installations. The PP-R pipe and desired fitting are simply inserted onto an Aquatherm welding device and heated for a specified time (typically only seconds), then joined together. Once fused, pipes and fittings have the same physical properties, eliminating systematic weaknesses. Additionally, a faser-composite layer in the pipe reduces linear expansion of the pipe by 75% compared to other plastics, ensuring that it hangs rigidly even when subjected to high operating temperatures (up to 200°F). Fully recyclable, Climatherm is designed specifically for HVAC and industrial applications. He added that his crew typically realized labor savings of 20-25% versus copper since there is no cleaning and fluxing of the pipe, and due to its light weight relative to metal. TJ Dyer installer Dexter Campbell – a 30-year industry veteran – added that while thereis a learning curve involved with the Aquatherm heat fusion weld, “I’ve never been a fan of any plastic, but with this fusion, it’s more like welding and you can see the bead of the connection,” he said. Campbell continued: “It takes a little more planning, and we did a lot more prefabbing with it than we would have with copper, but I would use it again – it works really well. PVC might be easier, but it’s not nearly as reliable.” The piping installation moved quickly, with not a single leak reported throughout the entire project. Additionally, the lighter weight of the PP-R compared to copper in four-inch lines was a huge labor-saver. “It was a lot easier working with the three- and four-inch polypropylene on ladders than it would have been with copper or welded pipe,” Kleinholz said. 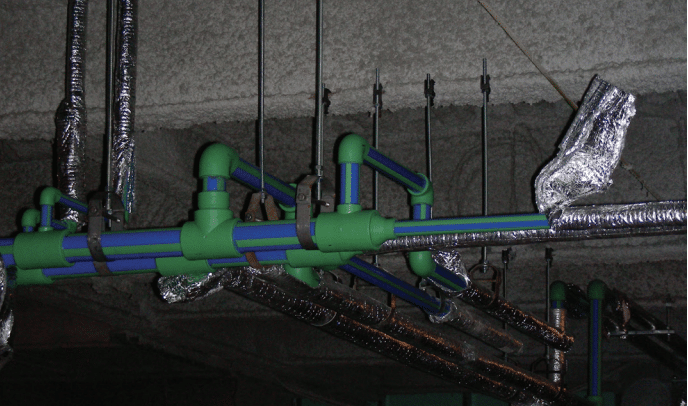 The Climatherm pipe was insulated in plenums to meet codes, but since it has a natural R-value of 1, no additional insulation was necessary, offering additional material and labor savings. The heating system, which has now been operating for nearly a year, uses Trane and Sondex, Inc. heat exchangers, Taco pumps ad Evapco cooling towers. Streamkey’s Schultz took three engineers to the project when it was completed and operating, and he observed: “We were on the twelfth floor and someone asked when they were going to turn the water on to the heat exchangers because he couldn’t hear the water running. The thing is, the water was on, and the system was so quiet due to the natural insulation of the PP-R system. He couldn’t believe it.” All reports on the heating system piping have been positive and the key players on the job were most impressed with Aquatherm. So while the residents likely have no idea that an innovative piping product helps deliver their comfort, the people who worked on and operate the heating system know better.